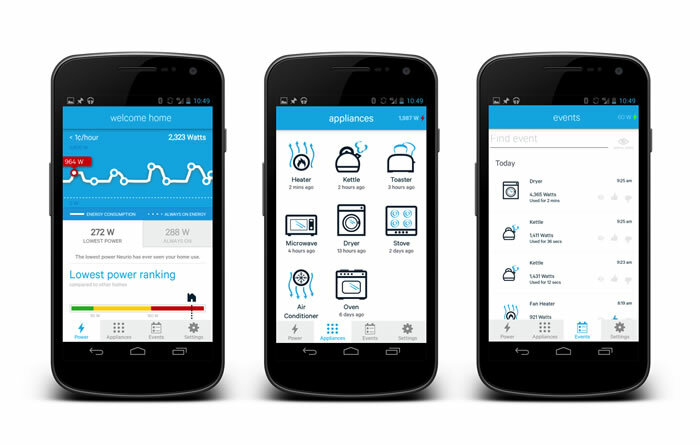 Once the Neurio Sensor is installed on an electrical panel, it sends the data via WiFi to the secure cloud where the smart algorithms identify the unique power pattern by each device in real-time to tell whether a specific appliance is in use or off, and how much energy it consumes. This information is then sent in real-time to the homeowners smartphone via the Neurio Android or iOS app. Neurio is designed as an open platform to work hand-in-hand with other smart home products. Neurio makes other smart devices even smarter by providing real-time data and analysis about the home. These integrations right now are planned at the cloud level so we don’t have to worry about an lack of protocol compatibility. Also through Neurio’s open API and integrations with 3rd party applications such as IFTTT and Spark, Neurio is encouraging developers, makers and hackers to create their own experiences with Neurio, ultimately providing consumers with an incredibly robust and beneficial platform. Neurio is a bit unique in this regard as we act as the hub of the home, provide software and app for user interface, do energy management and also make non-connected device, connected. Most of our users choose to install the Neurio Sensor themselves. It usually takes about 15-20 minutes and it’s completely reversible as you don’t have to cut any wires. However, if you not comfortable around electricity, we highly recommend you have an electrician install it. Neurio is an intelligent, open platform that with only one sensor brings smart home capabilities to the entire home, with future versions providing intelligence for all existing appliances. As the “brain of the home,” Neurio connects both older appliances and newer “smart” devices to allow users to easily track, monitor and better understand how their home is operating, such as letting the user know when their kids come home, or if they forgot to turn something off before leaving for the day. Neurio makes it simple, affordable and practical to bring smart home technology, and its benefits, to the masses.